Disney GIF gives users access to GIFs and emoji from popular Disney properties, including Star Wars and Disney Pixar films. Disney Interactive has announced the release of Disney GIF, its free mobile keyboard app that lets users access GIFs and emoji from popular Disney properties, and share them with friends while messaging. Once activated within a device’s keyboard settings, Disney GIF content appears within a new keyboard option during text entry. The keyboard offers multiple tabs for browsing, allowing users to browse for GIFs based on mood (like love, dance party or funny, as examples) or by brand. In the brand menu, content is split into four major sections (so far): Disney, Star Wars, Disney Pixar and ABC, with some categories being broken down further based on film or topic. For instance, the Disney category offers sections for Aladdin, Cinderella and many others, while the Disney Pixar section features six films at launch, including Inside Out and Toy Story. When users find an item they’d like to share, they tap to copy the GIF or emoji, and can paste it into a text message or email, as examples. 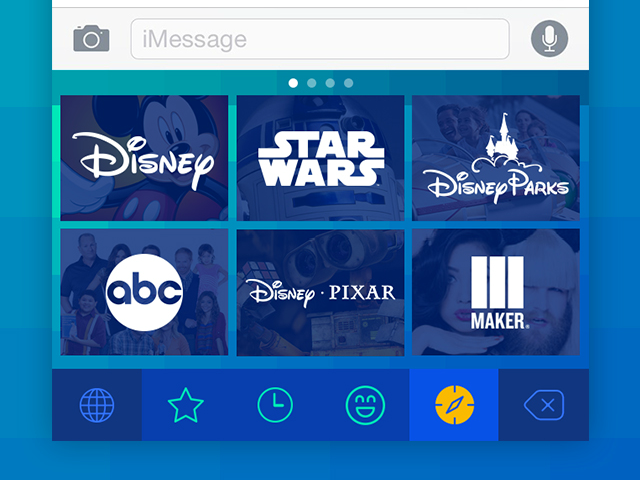 The Disney GIF app itself offers a store for purchasing premium content; at launch, the app offers Frozen emoji and Frozen animated emoji packs for $0.99 each. Disney GIF is available to download for free on the iTunes App Store. The app features more than 200 GIFs at launch, with more planned for future release.